Dr Moshweu Mampe, an academic from the North-West University’s (NWU’s) Faculty of Education, recently conducted research on factors that impede learning support and the availability of support structures for learners with language barriers to learning, especially at primary school level. 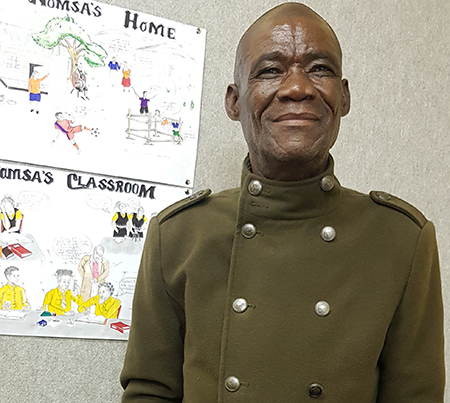 Dr Mampe says he noticed that there were a number of challenges around mentoring, monitoring and support, especially in the domain of reading, writing, spelling and mathematical calculations of learners with language barriers to learning. “The structures and programmes in mainstream schools are inadequate to facilitate support for leaners with language barriers to learning,” says Dr Mampe. “Without proper support for these learners, effective teaching and learning cannot be attained. This support is not only needed for learners, but also for the teachers who teach them. “If learners with language barriers to learning are not supported, particularly in reading, writing, spelling and mathematical calculations, they are unable to perform at school. If teachers are not supported, they tend to suffer from teacher burnout and anxiety that lead to difficulties in teaching these learners,” he says. The study recommends that mainstream primary school teachers should properly screen, identify, assess and support all learners. Getting to know learners adequately, identifying their individual needs and gathering and interpreting information about them are essential. Teachers also need to be provided and equipped with different strategies to assist schools and improve support in spelling, reading, writing and mathematical calculations to promote effective teaching and learning in mainstream primary schools. Dr Moshweu Mampe believes that learners with language barriers to learning need proper mentoring and support to perform at primary school level.